I find pocket journals very convenient when travelling or when being out of my studio. I never know when I will find something that needs to be put in my journal asap, either with my pen or my watercolor set. This is the reason why I always carry in my bag a small case with the bare necessities: a portable watercolor set, a water brush, pen, pencil and eraser. 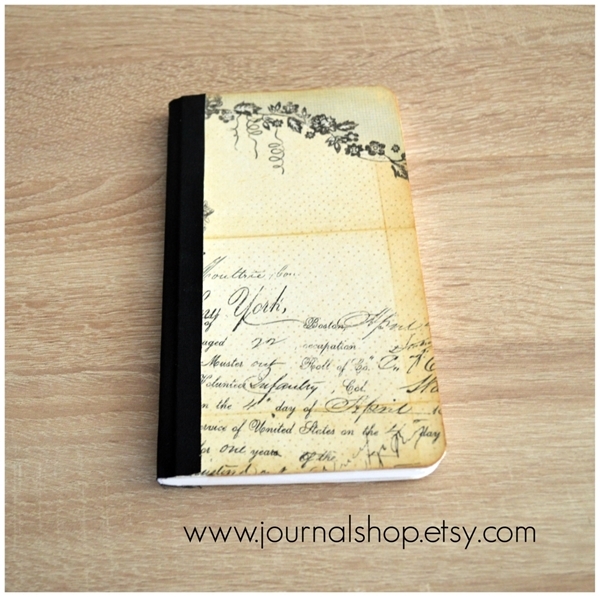 And of course a journal. Small to be constantly carried in bag, but also big enough for my ideas. I even use them for notes or lists or as quick scrapbooks - these little books are not only beautiful and inspirational, but also very convenient! This listing is for a journal with 56 pages (counting both sides). It is a hardcover book, with a black bookcloth spine, and its size is very convenient to be carried in your bag or even inside your watercolor art case. Its unique measurments of 10.5 x 18.5 cm (4 1/4 x 7 1/ 4 inches) add to the vintage feeling. It is bound with Irish waxed linen thread for extra stability. The covers are dressed with vintage scrapbooking paper and the edges are distressed by hand. The pages are an Italian Fedrigoni watercolor paper of 120gsm (95lbs). It is a great piece that will inspire you every time you open it. It would be a great gift as well, for people who love to be surrounded by beauty, vintage and inspiration. In order to cut the shipping costs, these journals are shipped with simple priority mail (unregistered). If you prefer to upgrade to a signed service, please contact me before purchase to upgrade your shipping.